I'm taking a little break before I sit down and hash out the last in the "Down, Down, Down" series to post some vignettes of Gladstone Avenue. One of the first posts on this blog was a Before & After of the building that now houses the re-Cycles Bicycle Co-op. Well there was another shot from the series in the photo where I got that "then" photo that looked familiar. 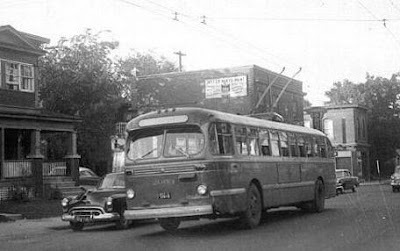 This one (qualifying this post to be in the Centretown Heritage Project series). Though the roads and buildings have changed (for example, the patio on the foregound building and the windows on the background building), they are all still there. You can compare the pattern between the second-storey windows on the middle building to confirm it's the same building. As I first found out from David Reevely, this house had been slated to be demolished "next month" in July 2008 and replaced with some townhouses, but evidently that fell through. The City told the building owner that he had to clean up the graffiti on the outside of the house a month before it was slated to be demolished. So Gary Stunden, agent for the building's owner, Ali Shafiei, decided to paint it yellow, partly as a gimmick, and partly to tease the City for doing something as silly as ordering him to clean it up with only a month left until it was demolished. Almost a year later, who's laughing now? That's in the same neighbourhood as Gladstone and Kent, which I photographed in This post leading up to a CCCA meeting. Moving further West from the Yellow House, we get to the Gladstone theatre. I had previously posted about the Facade reconstruction of the Gladstone, and the Light Rail Now! event at the Gladstone, which features a nice shot of the building with "Light Rail Now!" in the marquee. 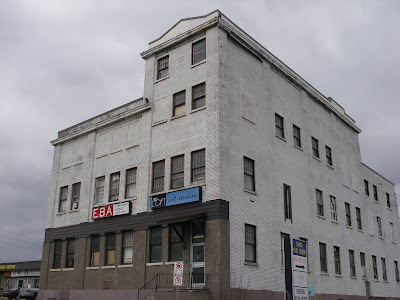 Continuing past the O-Train tracks, we get to the 1924 Enriched Bread Company building. The Enriched Bread Artists have a good writeup on the history of this building on their website. So that's a little taste of Gladstone! I suspect your affinity for the Overseas Electronics store photo has something to do with the quality of light and the composition. It looks like you took the pic at "Kodachrome time" (just before sundown), when the sun is shining horizontally and given a nice golden hue by the particulates in the atmosphere. That's what gives the clouds the purples, greys, and pinks. The composition has a lot of parallel lines (the curb, the yellow line on the road, the phone lines, the verticals on the house), perpendicular lines (the horizontals on the house and fence vs. the road), and some perspective (the fence and house disappearing into the background). The other photos look to have been taken when the sun is high, so they don't benefit from the sundown colours.